Un penthouse confortable exceptionnel avec une terrasse sur le toit privée donnant sur la mer des Caraïbes. Les conforts modernes et les détails antiques originaux embrassent et éclairent une atmosphère de vacances. La plage est juste au coin de la rue, tout comme les cafés. Cette suite comprend de nombreux détails de design classique, des carrelages colorés uniques fabriqués à la main. Les grands planchers de bois en planches dans la chambre, balustres en bois, détaillées et volets blancs. Les nombreuses grandes ouvertures accueille brises de mer et de soleil, tous ajustés à votre goût. Cette élégante atmosphère des Caraïbes vous détend instantanément au début de vos vacances. Ce penthouse est au 3ème étage, accessible par des escaliers. Il y a un petit ascenseur pour les bagages et l'épicerie, donc vous n'aurez pas besoin de faire des choses avec vous. Nos clients bénéficient de wifi gratuit, TV avec NetFlix, ménage deux fois par semaine. Accès plage publique est juste autour du coin. Suites des étages supérieurs peuvent utiliser l'ascenseur électrique pour leurs bagages / épicerie. L'eau de bouteille est incluse comme sont des serviettes de plage. Clubs de golf disponibles à emprunter. Un fabuleux massage de 90 minutes peut être organisé dans votre suite. Les animaux domestiques sont les bienvenus à la Plantation House, veuillez vous renseigner. Il y a un petit supplément par séjour. Such a wonderful little sanctuary away from home! I would highly recommend the beautiful plantation home. Joe and Francoise were extremely welcoming, and responded to us every time within the hour! Great location! The porch is just heavenly; waking up to beautiful sunsets over the ocean everyday, shall be greatly missed. If you are thinking about taking a trip to Playa stay here! Thanks so much Joe and Francoise!!! 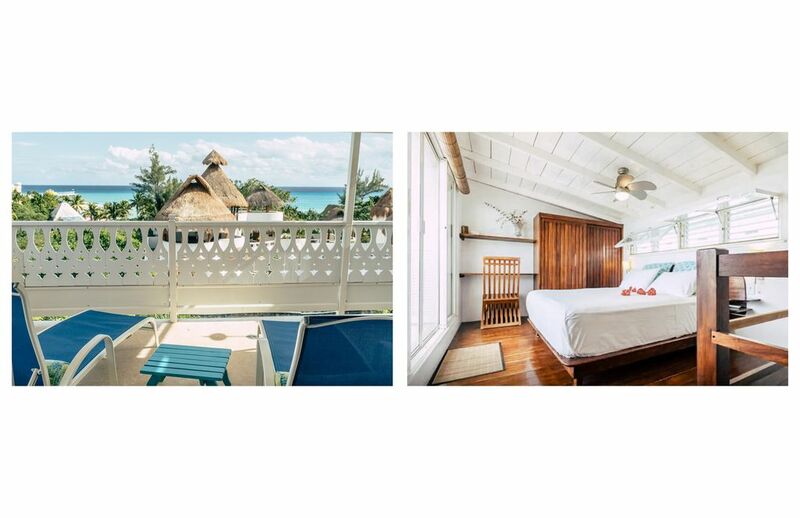 I did a lot of searching for a romantic place in Playa del Carmen and found this to be a great value for an incredibly sweet, lovely home away from home. The place was fully as-advertised. I saw others complained about the stairs to access but really this is part of the charm of the place. If you're looking for an elevator, go to one of the big hotels. (And they *do* provide a lift you can use to bring all your luggage up and down!). One of the things I love about this place -- in addition to being beautifully constructed -- is that there's fabulous air flow. No need for air-conditioning: just open the screened windows/doors and turn the ceiling fans on. The only reason I gave it 4 stars for location is there was a bit more noise from the many local venues playing loud music than I'd expected but this *is* Playa del Carmen, so you'd really have to get away from things altogether to avoid any noise. The hosts were kind, responsive and helpful. I'd highly recommend this very charming spot! It seems like a rare find in P de C.
I thought this was a nice looking place. A restuarant directly across the street was Great! However, 3 flights of stairs, a very narrow stairs loft was way to narrow and dangerous! The ceiling fan in the living room did not work. And when it did, it would not stay on! Getting a hold of Jo was a huge task in itself. I am sure he is a very nice guy as I was told but getting a hold of him was difficult! ALL the beaches were seaweed in and you could not swim or enjoy the beaches close by. Of course this was of no fault to Jo, but just the same we checked out a day early disappointed. Absolutely beautiful place!! can not beat the location or the charm of this little gem! We will definitely recommend this place to everyone we know. Thanks Jo for all your friendliness and suggestions. Hopefully see you next year:) We stayed in the St. Barts suite and had amazing ocean views off our back deck along with all the comforts of home. Thanks Again! This Plantation House couldn't have been more perfect. A beautiful property and the location was great and close to everything. 15 minute walk to the grocery store if you wanted. Loved waking to the sunrise and an ocean view. Some noise in the evening from local bars but wasn't awful nor would it sway us from revisiting. This place was far to beautiful and well kept to not consider coming back. Highly recommended!